Just a week before the official Mi 8 announcement, rumors started flying in. Yesterday a hands-on video leaked showcasing a gorgeous translucent back, much like the Translucent Blue variant of HTC U12+, and now we know what's peeking through the back panel. 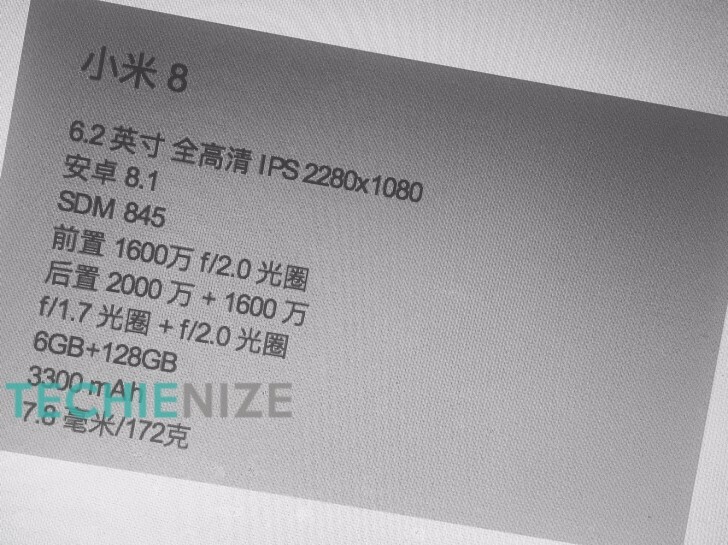 The leaked photo shows a 6.2-inch Full HD (1080x2280) display with 19:9 aspect ratio contradicting previous reports of a 6.01-inch display. We are also very excited by the in-display fingerprint scanner so we hope this one turns out to be true. Anyway, the list goes on with Snapdragon 845 chipset, which is hardly any surprise, 6GB of RAM and 128GB of internal storage. Some reports also claim that the Mi 8 will have an 8GB RAM variant but this isn't mentioned here. On the rear there are two cameras - 20MP (f/1.7) and 16MP f/2.0 units, while at the front sits a 16MP f/2.0 snapper. The Mi 8 will run MIUI, which is debuting alongside it and it's going to be based on Android 8.1 Oreo out of the box. The phone will measure 7.8mm in thickness and will weigh around 172g fitting a 3,300 mAh battery. The authenticity of the specs sheet is a bit hard to confirm at this point so don't take anything for granted. We will know for sure once the device goes official on May 31.